Hey everyone. This is a new feature getting added to MossRanking in the coming weeks, just for fun. We assigned 5 tiers to many of the individual categories. They are available to players of all skill levels, and the first tier always consists of just completing the category (except for some score runs). Then, we combined similar categories into groups and created achievements. You need to reach the tier in each category of an achievement to acquire that achievement. There are only two exceptions to this rule. First is the Challenger achievement, which has 5 categories (No%, Landmine%, Showball%, Key to Yama and Udjat Run). Here, you gain a tier for each category completed. The other exception is the Moss Tier achievement. 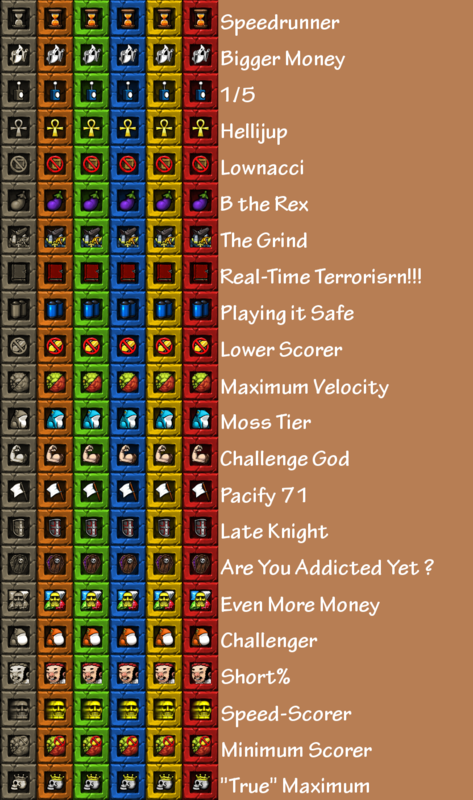 In this achievement, a tier is gained each time all of your runs in Mosspoint categories meet the following criteria: all completed, all 20%, all 40%, all 60%, all 80%. Here's an example: Speedrunner tier 3 (blue background) is achieved when a runner has satisfied the tier 3 requirements for all included categories, which are Any%, Hell% and Low%. Tier 3 times for those categories are sub 3, sub 8 and sub 4, respectively. Lower tiers must be met to achieve a higher tier (you can’t be at tier 3 without satisfying tier 1 and 2). The specific categories in each of these achievements will be revealed later, but you can get an idea of what some of them will consist of from their names.